Pawel Skrzypek received his Master of Arts from the Frederic Chopin Academy of Music in Warsaw, Poland in 1977. He completed four years of master studies of Postgraduate Professional Performance Master Course at the Royal Northern College of Music in Manchester England from 1979 to 1983, under the distinguished tutor Professor Ryszard Bakst, disciple of both Polish and Russian masters’ esthetic school (Zbigniew Drzewiecki, Konstantin Igumnov, Harry Neuhaus). Professor Skrzypek is a winner of several piano competitions, as well as laureate of many other awards. In 1982 he was honored with the Worshipful Company of Musicians of London medal, awarded for outstanding achievements in piano performance. He has also won several prizes and awards in his native Poland. As one of the most active Polish pianists, Pawel Skrzypek has maintained a rigorous performance schedule. In Poland he has often appeared as a guest performer with the major philharmonic orchestras and participated in important music festivals. He was also occasionally engaged to play chamber music and collaborated with the renowned Camerata String Quartet and Leszek Swidzinski, tenor. He has performed in most European countries, having been invited to such prestigious halls as the Beethovensaal in Vienna, and in many international music festivals including the International Sintra Festival in Portugal and the International Chopin Festival in Duszniki Zdroj, Poland. His American debut took place in 1990 in Sacramento, Russian debut took place in 1992 (performance for an audience of six thousand in the Main Hall of the Kremlin Palace of Congress in Moscow) and Japanese debut took place in 2003. Pawel Skrzypek has also performed in Northern Africa (Algeria, Tunisia), Southeast Asia (Indonesia, Malaysia, Thailand, Japan, South Korea, Hong Kong) and Canada (British Columbia). Since 1990, he has journeyed regularly to the U.S. both to teach and perform. In addition, he has recorded for the BBC, the Russian State Radio and Television, and many others including the National Public Radio in the United States, which broadcasted his 1993 Austin, Texas recital nationwide. He has made a number of archival recordings for the Polish Radio and Television. Beside of the greatest piano repertoire these recordings include numerous important masterworks of Polish composers, such as Dobrzynski (Piano Concerto), Melcer (Morceau Fantastoque) and Paderewski (Variations and Fugue in E flat minor). Skrzypek’s performances have been praised by numerous reviewers and aficionados. The opinion written by the well-known Californian critic William Glaskin can be quoted as typical: The modern world of music seems heavily populated with piano virtuosos. But in his technical brilliance, and even more in the intensity of his physical and emotional approach to the music, and in the power he has to express it, Skrzypek seems truly extraordinary. 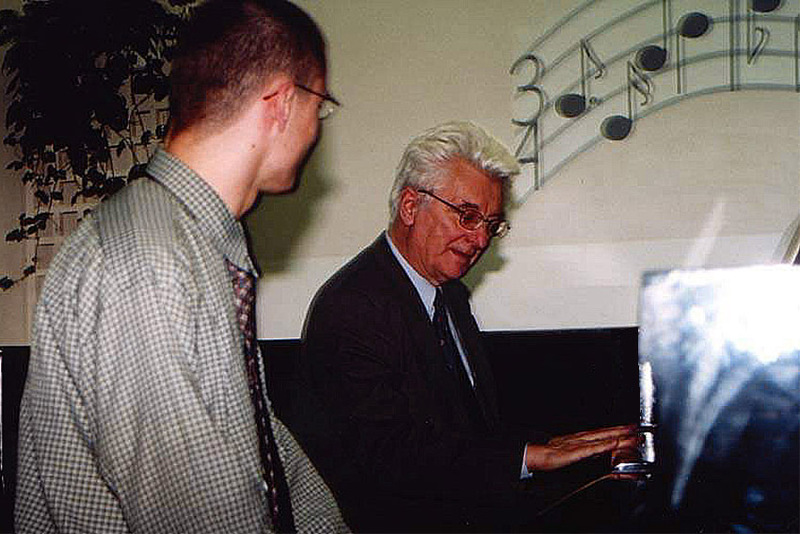 In 1984 Pawel Skrzypek began his teaching career at the Frederic Chopin State School of Music in Warsaw, where he was a chairman of the Piano Department for 14 years (1992-2004) and presently he serves as director of the school. He received his Doctorate in 1992, his Assistant Professor Degree in 1996 and University Professor degree in 2004. Since 2004 he serves as Professor of Piano at the Warmia-Mazury University in Olsztyn, Poland where he chairs the Piano Studies Department, between 2006 and 2016 he worked as the Professor of Piano at the Frederic Chopin University of Music in Warsaw (Instrumental Pedagogy department in Bialystok), Poland. Pawel Skrzypek continues to conduct piano courses in interpretation internationally. His many master classes include Vancouver Academy of Music (Vancouver, British Columbia), Conservatoir di Musica (Kuala Lumpur, Malaysia), Thai Chopin Society (Bangkok, Thailand), Yayasan Pendidikan Sekolah Music (Jakarta, Indonesia) and several organisations in the United States. From 1990 through 2000 most of his master classes outside of Poland took place in the U.S., on the West Coast, with appearances at the University of California, Davis, California State University, Sacramento, the San Francisco Conservatory of Music, Chopin Foundation of the U.S. (San Francisco), University of California (Los Angeles), Western and Central Universities of Washington. Expanding his involvement on the West Coast, in 1999 he founded the Gold Country Piano Institute – one of the leading U.S. international piano courses in the historic town of Nevada City, California. During ten years (1999-2009) he served as Artistic Director of the GCPI Faculty joined by such piano professors as John Perry of Los Angeles, Lee Kum-Sing of Vancouver, Thomas Hecht of Singapore and Mark Ray as well as Graham Scott of Manchester. From 2006 through 2013 he served as President of the Polish Piano Teachers Association (EPTA-Poland). Since year 2000 he directs one of Poland’s leading piano courses, the Warsaw Piano Workshop, which is held every August at the Frederic Chopin State School of Music. His students regularly win top prizes at piano competitions. Pawel Skrzypek was awarded several prizes for his outstanding pedagogical and artistic achievements, including two Awards of the Polish Ministry of Culture and National Heritage (1998 and 2008), three Awards of the Artistic Education Centre, the Cross of Merit as well as the Medal for Merit to Culture – Gloria Artis (2017). Commenced learning to play the piano in the age of five, initially working with Zdzislaw Tanewski, subsequently with Adam Podrez. Has graduated from the Karol Szymanowski Academy of Music in Katowice in piano class of Prof. Czeslaw Stanczyk and chamber music class of Prof. Maria Szwajger-Kulakowska. Afterwards has mastered his piano skills within postgraduate piano studies with Prof. Alicja Paleta-Bugaj at the Fryderyk Chopin Academy of Music in Warsaw. Has also graduated from Postgraduate Studies of Foreign and International Service at the Faculty of Law and Administration of the Adam Mickiewicz University in Poznań, Poland. In recognition of his piano skills and contribution to the popularization of Chopin’s music in Siberia, received the highest honorary title, accessible for foreigners in Russia – Visiting Professor of the National Research Tomsk State University. Przemyslaw Lechowski is laureate of Polish and international piano competitions. Has performed in Poland, France, Russia, Germany, Norway, Italy, Lithuania, Czech Republic, Romania, China, Indonesia and Lebanon – overall performing more than two thousand times. Has been a jury member of international piano competitions. Since 2010 is a vice-chairman of the Jury of The Siberian International Chopin Piano Competition in Russia and has represented this competition at the international Chopin Competitions’ Conferences organized by the Fryderyk Chopin Institute. Since 2012 is a vice-chairman of the Jury of The Galaxy International Piano Competition in Indonesia. Originator and artistic director of the International Piano Festival Chopin in the Heart of Warsaw, taking place in the Holy Trinity Church – an official Chopin place. Gave numerous concerts in places connected with Frederic Chopin – in Zelazowa Wola, Brochow, Duszniki, Szafarnia, Sanniki, under his monument in Lazienki Park (Warsaw), Kordegarda Chopin2010 and in Paris. In 2010 was an organiser and performer of concert The Longest Birthday. This 171-hours performance of hundreds artists from Poland and abroad connected two official dates of Frederic Chopin’s 200th birthday – February 22nd and March 1st and was described in medias all over the world. The Longest Birthday won two S3KTOR awards from the President of the capital city Warsaw: Grand Prix and award for the best NGO’s cultural event in the capital city of Warsaw in 2010. Participated festivals (Chopin Festival in Russia, Chopiniana, Chopin Birthday). During official Chopin Year Celebrations performed in Grand Serail – Palace of the Prime Minister of Lebanon, in the Arkhangelsk Philharmony, at vernissages of Chopin and his nostalgia exhibitions by famous Polish photographer Tomek Sikora as well as in the project Nocturnos. Iwo Zaniewski and the pianists. Has performed piano recital together with Halina Czerny-Stefanska, the first Polish winner of the International Fryderyk Chopin Piano Competition. Przemyslaw Lechowski has appeared in multimedia exhibition Chopin. Stories, has taken part in the film Meet the World about art of piano, made by French director and composer Fowzi Guerdjou. Has been co-organiser and performer of varsovian festival Chopin in the gardens of Polonia House, connected with piano masterclasses Playing Chopin. Furthermore, for three years appeared in the performance Frederic Chopin – Homo Artifex. Together with Polish clarinetist Anna Kalska took part in the first edition of program The New Interpretations by the Institute of Music and Dance, performing works of Polish contemporary composers Stefan Kisielewski and Witold Lutoslawski. Has been a multiple scholar of program Polish Culture in the World by the Adam Mickiewicz Institute. Since 2004 leeds his piano solo class at the Frederic Chopin State School of Music in Warsaw, the oldest music school in Poland. Since 2014 is a Head of Piano Department in this school. He possess the highest professional status in Polish educational system – Diploma Teacher. He has acquired the Qualified Teacher Status (QTS) for England as well. Przemyslaw Lechowski gives piano masterclass in Poland, Russia, Lithuania, China and Indonesia. Since 2010 is lecturer of the Warsaw Piano Workshop, in 2015 became its Organizing Manager as well. Member of The Siberian Chopin Committee, The New Art Association and The European Piano Teachers Association (EPTA- Poland). Graduated from the Mieczyslaw Karlowicz State Music Lycee in 1956, where he studied with Ada Glowacka, and at the last year with Stefania Allinówna (Diploma with distinction). In 1962 graduated with distinction from the State Higher School of Music in Katowice (at present – Academy of Music) in the piano class of Associated Professor Stefania Allinówna. In 1959, still as a student, begun his pedagogical work in the State Higher School of Music in Katowice, where directly after graduation was employed. In 1967 was offered position of assistant at the Department of Piano, then after first degree qualification in 1969 became an assistant professor. Between 1971 and 1979 worked additionally at the State School of Music in Bytom to enrich his pedagogical experience. In 1972 designed, organized and became manager of famous holiday camp for young pianists in Nysa. Approximately 30 participants attended the camp – pupils, students and graduates of schools and universities from Bytom, Opole, Nysa, Gdansk and Katowice. Prof. Andrzej Jasiński and Prof. Jerzy Sulikowski joined its faculty. The form of the camp, program of classes, participants and disinterested contribution of work by its faculty was unique to national scale. Similar camps were repeated in the same shape in 1973 and 1974. Among participants of that camp were presently well-known pianists, among others Krystian Zimerman, Ewa Pobłocka and Eugeniusz Knapik. In 1973 Czeslaw Stanczyk organized work of the Pedagogical Studium at the State Higher Music School in Katowice and was its manager from 1973 to 1981. Between 1977 and 1979 was also a manager of the Overal Piano Didactic Team. 1975 made 3-months long internship in piano class of Prof. Vladimir Natanson at the Tchaikovsky Conservatory in Moscow, where he attended classes of numerous outstanding personalities of piano pedagogy – Zak, Bashkirov, Milstein and Naumov. He was working with his piano repertoire with them, additionally attended lectures at the Qualifications Improvement Faculty. In 1976 actively attended Bartok Seminar in Budapest. In 1978 after qualification at the Academy of Music in Kraków received rank of an associated professor and in the academic year 1980/81 was nominated for this position. Between 1981 and 1983 worked in Hochschule für Musik und Darstellende Kunst Mozarteum in Salzburg (Austria). In 1984 became a Dean of the Instumental Department, than again – for the second term of office – in 1987 and took this position till 1991. Between 1988 and 1993 full-time worked in the Higher Pedagogical School in Czestochowa. For one academic year 1993/1994 was a Head of Piano Chair at the Academy of Music in Wroclaw. In 1999 additionally begun working in the Mieczyslaw Karlowicz Music Lycee in Katowice. During last years he was working as a piano professor at the Ostrava University (Czech Republic) as well. Apart of pedagogy, to which he took particular emphasis, he was also dealing with concert activity. Since the end of fifties cooperated with several philharmonic orchestras – National Philharmonic in Warsaw, Silesian Philharmonic in Katowice, Pomeranian Philharmonic in Bydgoszcz as well as philharmonic orchestras in Opole, Rybnik and Koszalin. Has performed many concerts as a soloist, chamber player and accompanist, while abroad – in Moscow, St. Petersburg, Salzburg, Prague, Algiers, Ostrava and Rijeka. Since over 30 years consults Polish music schools, gives lectures, seminars for students and teachers, attends jury panels of diverse piano competitions, both national and local. During last years has repeatedly been memeber of the jury in the Piano Competition organized by the Fryderyk Chopin Society in Warsaw, Chopin Competitions in Antonin and Szafarnia, Polish Competitions organized by the Artistic Education Center as well as in Piotrkow Trybunalski, Plock, Bielsko-Biala and many others. Many times was chairman of juries at mentioned competitions. He is a lecturer at the summer courses for young pianists in Warsaw (Warsaw Piano Workshop), Bystrzyca Klodzka and Lublin. Together with Pawel Skrzypek was lecturer and co-organizer of the Podlasie Musical Meetings in years 1998-1999. He lead masterclass in Croatia – in Zagreb, Dubrovnik, Split and Rijeka. For several years has been member of the Program Council and Jury of the Young Scene of the Polish Piano Festival in Slupsk. For many years he was also a consultant and expert of the Ministry of Culture, working in commissions awarding qualifications for teachers of first and second degree music schools. In that time – as a chairman of the commision created by the Artistic Education Center – prepared piano curricula for first and second degree music schools in Poland. He has been invited more than twenty times by Academies of Music in Warsaw, Katowice, Kraków and Poznan as a reviewer of first and second degree qualifications of academic teachers. Between 1989 and 1992 Pawel Skrzypek was – till his first degree qualification – an assistant at the Academy of Music in Katowice under protection of Prof. Czeslaw Stańczyk. He has educated over twenty graduates, which are taking serious places in piano pedagogy and concert life in Poland and abroad: Eugeniusz Knapik – Katowice; Maria Magdalena Janowska-Bukowska – Wroclaw; Maciej Pawela – Sydney; Tadeusz Biernacki – Vancouver; Alina Klimaszewska – Houston; Gabriela Szendzielorz – Katowice; Zofia Antes, Przemyslaw Lechowski, Tomasz Lupa – Warsaw. Joanna Marcinkowska graduated with honors from the Ignacy Jan Paderewski Academy of Music of Poznań in the class of Prof. Waldemar Andrzejewski, whose assistant she subsequently became. In 2014 she was conferred the academic degree of PhD Hab. of Musical Arts and from 2016 she is a Professor at the Department of the Pianoforte of the Academy in Poznań. She is a leading Polish pianist of the younger generation. She has won awards and prizes at twenty-one international and Polish piano competitions and festivals, including: the 1st prize at the International Piano Competition Artur Rubinstein In Memoriam in Bydgoszcz (1996); the 1st prize at the 7th European Chopin Competition in Darmstadt (2002); the 2nd prize and a special award for the best performance of pieces by Szymanowski at the 5th International Karol Szymanowski Competition in Łódź (2001); the 3rd prize and an award of the audience at the 5th International Piano Competition in Cologne, Germany (2001); the main prize at the 30th Festival of Polish Piano Music in Słupsk (1996). Joanna Marcinkowska has given recitals and performed as a soloist with symphony orchestras in many cities of Poland. She has appeared with such renowned ensembles as the Polish Radio Chamber Orchestra Amadeus under Agnieszka Duczmal or the Orchestra Concerto Avenna under Andrzej Mysiński, and with distinguished Polish and foreign conductors including Massimiliano Caldi, Helmuth Froschauer, Ian Hobson, Bohdan Jarmołowicz, Vladimir Kiradjiev , Agnieszka Kreiner, Aleksandar Marković, Andrzej Mysiński , Marcin Nałęcz-Niesiołowski, Grzegorz Nowak, Marek Pijarowski, Janusz Przybylski, Wojciech Rajski, Jerzy Salwarowski, Till Schwabenbauer, Gert Sell, Ruben Silva, Tadeusz Strugała, Ewa Strusińska, Piotr Wijatkowski, Jan Miłosz Zarzycki. She has given recitals abroad in Austria, Bulgaria, the Czech Republic, France, Germany, Great Britain, Hungary, Macedonia, the Netherlands, Portugal and Sweden, and outside Europe in the USA and China. She has taken part in numerous prestigious piano festivals in Poland and abroad. She gave recitals and performed as a soloist with symphony orchestras at International Chopin Festivals in Duszniki-Zdrój (1997, 2000), Antonin (Chopin in the Colors of the Autumn 1996, 2012, 2016), Vienna (1999), in Salzburg at the famous Mozarteum-Saal (1999), Gaming (1997), at the International Festival Eminent Winners of Piano Competitions in Hanover (2002), at Festivals of Polish Piano Music in Słupsk (1996, 2000, 2004, 2007, 2011, 2013, 2016), the Paderewski Festival in Warsaw (2014), the Festival Paderewski Days in Kąśna Dolna, the Festival Music and Visual Arts in Lublin, the 1st International Artur Rubinstein Festival in Łódź (2008), the 1st Chopin Festival Chopiniada at the Little Philharmonic in Puszczykowo, the 2nd Musical Festival Barbakan in Kraków (2009), the Festival The Stars Promote in Jelenia Góra (2010), the Festival Piano Passion in Saint-Étienne (2010), the Festival Frederic Chopin Spring in Gliwice ( 2012 ) and the Witold Lutosławski Festival in Szczecin (2000); at the latter event she gave the première performance of the 4th Piano Sonata by the Poznań composer Mirosław Bukowski. In 2002 she gave recitals of pieces by Karol Szymanowski at International Musical Festivals in Sofia and Plovdiv (Bulgaria). Joanna Marcinkowska has recorded compositions by W. A. Mozart, J. Haydn, R. Schumann, F. Chopin, I. J. Paderewski, P. Czajkowski, C. Debussy and K. Szymanowski, released on compact disks and cassettes. The television programs in which she has performed include a recital of music by Chopin, recorded on the 187th anniversary of the composer’s birthday. She has also recorded a program of Chopin’s music for Radio Merkury. She sits on the jury of competitions and conducts piano master classes at home and abroad. In 2009, she conducted a two weeks’ Master Piano Class at the Central School at the Conservatory of Music in Beijing. She also gave a special piano recital in that city. Joanna Marcinkowska has earned the Medal of the Young Arts, awarded to Poznań artists of the young generation for outstanding achievements, and the Hipolit Cegielski Medal of the Young Positivist for successful organic work, the Bronze Medal for Long Service and the Merit to Polish Culture honorary distinction. Furthermore, on numerous occasions she has been granted artistic scholarships of the Minister of Culture of the Republic of Poland and the Fryderyk Chopin Society of Warsaw, as well as those of the City of Poznań and the Marshal of the Province of Greater Poland. In 2013 she received the Artistic Award of the Marshal of the Province of Greater Poland and in 2015 the Rector Award of the Academy of Music in Poznań. Was a student of Ditlinda Czyż at the Stanislaw Moniuszko State Music Lycee in Bielsko-Biala. She completed with distinction her piano studies under the guidance of prof. Czeslaw Stanczyk and prof. Pawel Skrzypek at the Karol Szymanowski Academy of Music in Katowice, after receiving prestigious scholarships of Frederic Chopin Society, the Ministry of Culture and Polish Piano Festival in Slupsk, she was the first prize winner of the All Polish Frederic Chopin Competition in Warsaw in 1997. She continued her post-graduate chamber music studies with prof. Maria Szwajger-Kulakowska in Katowice. Zofia Antes has performed numerous concerts as a soloist and a chamber musician in Poland. She has also played piano concerts of Mozart, Chopin, Schumann, Rachmaninow and Kisielewski with many of the philharmonic orchestras in Poland conducted by Tomasz Bugaj, Jerzy Salwarowski, Zygmunt Rychert, Slawek Wroblewski. In 1996 she had her debut in the USA as a soloist, performing Chopin, Mozart, Beethoven and Schumann (recitals, piano concerts) as well as chamber music programme (Brahms). In 1999 she started a piano pedagogy activity in the Frederic Chopin State School of Music in Warsaw which she continues succesfully as a teacher of many prize-winners of Polish and international competitions. In 2007 she got her doctorate in Bach’s articulation, working as an adjunct at the Music Institute of Warminsko-Mazurski University in Olsztyn since then. Zofia Antes has been a lecturer of the Warsaw Piano Workshop and Gold Country Piano Institute in California for many years. Olga Łazarska belongs to the strictly leading group of Polish piano pedagogues. 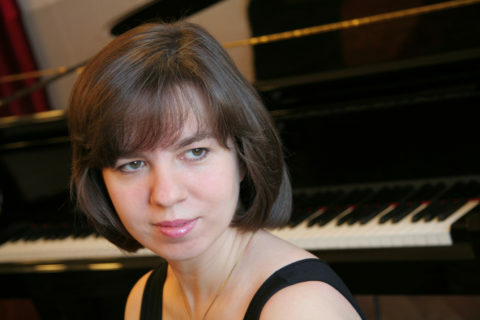 Since a number of years she is connected with Cracow; after graduation has been working as an assistant in the piano class of Prof. Ewa Bukojemska, subsequently became a senior lecturer in the Piano Chair of the Acadamy of Music in Cracow. She holds this position until now, among others she lectures Piano methodology with pedagogical literature, using program of her own authorship. The main field of her professional career is her activity at the Władysław Żeleński State School of Music in Cracow, where she is a Head of Piano Department – and the Frederic Chopin State School of Music in Cracow, where she performed similar function for eight years. She is a hairess of the best pedagogical traditions from Cracow and continues with passion work of her masters. She has been the originator and the organizer of methodological conferences under patronage of the Piano Chair of the Academy of Music in Cracow for teachers of piano from southern Poland. She is also a co-author of the project Gradus ad Parnassum, an undertaking directed to pedagogues from south-eastern Poland. Her students belong to the leading piano youth in Poland and successfully compete with young artists from around the world. A large group of talented students, who have won and continue to win successive stages of piano initiation under her direction, has become laureates of many national and international competitions. Over the past few years it is more than 100 prizes and awards. Olga Łazarska willingly shares her pedagogical experience, actively cooperates with music schools in Lesser Poland region, she leeds consultations, workshops and open classes in the entire Poland (Koszalin, Kielce, Wrocław, Bydgoszcz and others). For over 10 years she is a lecturer at the summer courses in Poland – in Kielce (formerly Olsztyn and Rzeszów), Szczecinek, Rabka, Krynica, Tomaszow Lubelski, abroad she has been giving lectures and courses in Vienna, Paris and Geneva. She often takes part in jury panels of competitions with national and international range (in Poland and abroad) as well as auditions organized by the Artistic Education Centre. Olga Łazarska is an expert in the field of piano performance enlisted by the Ministry of Culture and National Heritage of the Republic of Poland, she takes part in boards of examiners appointed by the Artistic Education Centre, awarding qualifications for teachers of piano. Started her piano education in the age of four, simultaneously learned to play the violin. 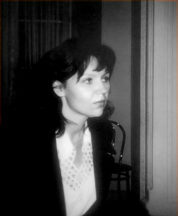 In 1976 she completed with distinction her piano studies under the guidance of Prof. Jan Ekier at the Higher State School of Music in Warsaw (at present – the Frederic Chopin University of Music in Warsaw), subsequently till 1978 continued her piano education within post-graduate studies under Prof. Victor Merzhanov. She made her debut with philharmonic orchestra in the age of 12. Beeing 14 years old obtained her first scholarship from the Frederic Chopin Society, then she was granted further scholarships between 1969 and 1974. In 1974 became laureate of the All Polish Frederic Chopin Piano Competition in Warsaw, in 1975 after qualifications to the Polish Team participated the IX International Frederic Chopin Piano Competition, in 1976 became a finalist of the Ferrucio Busoni International Piano Competition in Bolzano (Italy), in 1977 was a semi-finalist of the Clara Haskil International Piano Competition in Vevey (Switzerland) and in 1980 became a laureate at the Young Scene of the Polish Piano Festival in Slupsk. Joanna Kurpiowska ran intensive concert activity for several years. She has performed both as a soloist with most of domestic philharmonic orchestras as well as piano recitals in Poland, East Germany, Czechoslovakia, Hungary, Austria, Switzerland, Spain, North Korea and Italy. She made number of archival recordings for Polish Radio and Television, Polskie Nagrania has released her record with compositions of Robert Schumann. She began her pedagogical activity in 1987, since 1990 leads her piano solo class at the Frederic Chopin State School of Music in Warsaw. She has educated several dozens of pianists, laureates of Polish and international piano competitions in Poland (Warsaw, Plock, Krakow, Wroclaw, Konin, Szafarnia, Antonin) and abroad (France, Slovenia, Croatia, Italy, Great Britain). Her students performed in number of concerts and festivals in Poland, Germany, Austria, Belgium, Spain, USA and Japan. Her most outstanding graduates are young pianists: Agnieszka Przemyk, Marta Jarczewska, Tomasz Lupa and Krzysztof Moskalewicz, which are carrying out their intensive concert and pedagogical activities at present. Joanna Kurpiowska is a consultant of the Artistic Education Centre and Jury member of piano competitions (the Young Pianists’ Competition in Zyrardow, the Warsaw Piano Competition, Auditions of the Artistic Educational Centre). She leeds open piano lessons, seminars, masterclasses and lectures for teachers of piano, she also cooperates as a consultant with many music schools of the Mazovian region in Poland. She is a lecturer of the Summer Musical Courses in Szczecinek, the Warsaw Piano Workshops and the Bednarska Foundation. She has been awarded many times for her pedagogical activity, among others by an Award of the Artistic Education Centre. Graduated from the Tallat-Kialpsza High School of Music as well as from the Lithuanian Academy of Music and Theatre in Vilnius (1990) with degrees of pedagogy, accompanist and chamber musician. Between 1990 and 1991 she worked as an accompanist at the Vocal Department of that Academy of Music. Since 1993 she is an accompanist and pedagogue at the High School of Music in Suwałki and the Music School in Augustów. Between 1997 and 2013 she held position of Head of Piano Department. She was awarded by the President of Suwałki (2006) and three times by Award of the Artistic Education Centre (2008, 2013 and 2014). In 2013 she received the Merit to Polish Culture honorary distinction and the Medal of the National Education Commission. She holds a position of a piano lecturer of the consulting office of the Artistic Education Centre in Augustów. Graduates from her piano class continue their musical education in numerous Polish Academies of Music – in Gdańsk, Bydgoszcz, Białystok and Katowice. She has been member of jury panels at the numerous public auditions of the Artistic Education Centre as well as piano competitions in Poland and abroad. She also has been a lecturer of piano courses in Poland (in Krynica Górska, Szczecinek and Kielce). Students of her piano class have been awarded by prizes and distinctions of numerous piano competitions. Has graduated with distinction from Conservatorio Statale di Musica Antonio Vivaldi in Alessandria (Italy) in piano class – it gave him a Ghislieri prize for the best diploma of the year and a Premio Accademia Filarmonica prize. Afterwards has continued his education within post-graduate studies at Accademia Pianistica di Imola in piano class of Boris Petrushanski and Alexander Lonquich. Has participated masterclasses with Stanislav Bunin, Lazar Berman, Andrzej Jasiński, Tatiana Nikolaeva, Aldo Ciccolini, Peter Lang, Rosalyn Tureck oraz Dmitri Bashkirov. Thanks to scholarships from Österreichischen Bundesministeriums für Wissenschaft und Forschung and Ministero Italiano degli Affari Esteri has continued his education in Hochschule für Musik und Darstellende Kunst Mozarteum in Salzburg (Austria) at two departments – conducting with Michael Gielen and piano with Prof. Peter Lang – simultaneously studying composition at Conservatorio Antonio Vivaldi in Alessandria. Subsequently has studied conducting at Conservatorio Giuseppe Verdi in Torino (Italy) and, after graduation – thanks to scholarship from the Ministry of Foreign Affairs of the Republic of Poland – has studied piano in class of Prof. Andrzej Jasiński and composition in class of Prof. Eugeniusz Knapik at the Karol Szymanowski Academy of Music in Katowice (Poland). In 1995 won I Prize at the piano competition Città di Cesenatico, in 1999 received II Prize in Concorso Internazionale di Musica da Camera di Finale Ligure in two categories – Duo and Trio. Between 2004 and 2006 lead piano solo class at Istituto Civico Musicale in Alba (Italy). Since 2007 works as lecturer of piano and conducting in Musikakademie Kassel (Germany). He uses a wide perspective of a composer, conductor and performer in his work. Alberto Bertino has been a chief conductor of Opera Theatre in Torino, has been a musical director and conductor of an opera project Die Un-Heimliche Ehe at the University of Kassel (cooperation with students of the University of Kassel, Musikakademie Kassel and Staatstheater Kassel), has worked in the jury of an international vocal competition Franca Mattiucci in Canelli (Italy). In 2014 conducted the Lanzhou Symphonic Orchestra in China, he has been also invited to conduct symphonic concerts in Poland. Cooperated with Accademia della Voce in Torino and Staatstheater Kassel, has been giving piano and chamber masterclasses in Poland (Piwniczna Zdrój, Dębica). His compositions for choir (Alma Redemptoris Mater, Glora Tibi Trinitas, How make the day dawn?) have had their world premiere in St. Peter’s Church in Leipzig (Germany) by the MDR Radio Choir under conduction of Howard Arman. In 2008 Naxos published his long-playing record with compositions of Mozart. He speaks fluently five languages: Italian, Polish, German, French and English. Studied piano at the Academy of Music in Bydgoszcz (Poland) under Prof. Jerzy Godziszewski and Prof. Alicja Mikusek. After studies he started his pedagogical activity at the Szymanowski State School of Music in Plock, which he continues by now. Since 1984 he is a Head of Piano Department, he is also a deputy headmaster of the School. Between 2004 and 2009 he was leading his piano class at the Chopin State School of Music in Warsaw. He has almost 100 laureates and prize-winners of piano competitions within his pedagogical achievments, over 20 of his graduates have continued their further piano education at higher musical studies. Since 1994 he is a consultant of the Artistic Education Centre in the field of piano performance. He is invited for piano workshops, seminars and open classes by many music school in Poland. He is also an expert for the promotion of professional teachers. He regularly takes part in juries of many auditions and piano competitions in Poland, among others in Warsaw, Poznan, Lodz, Sochaczew, Plock, Radzyn Podlaski, Zyrardow, Starogard Gdanski, Wloclawek. In 2000 he took part in the Jury of the I International Halina Czerny-Stefanska Piano Competition in Aomori (Japan). In 2009, 2011 and 2013 the Artistic Education Centre appointed him to the Jury of the final stage of the Nationwide Auditions for Piano Students of the 1st Degree Music Schools in Warsaw. In 1999 and 2000 he was a lecturer of the Summer Piano Course for students and piano teachers in Olsztyn and Augustow. Since 2001 is a permanent lecturer of the Warsaw Piano Workshop, which are held in the Chopin State School of Music in Warsaw annually. Since 2008 he is a lecturer (also coordinator recently) at the Summer Piano Course in Szczecinek. He is an artistic director of the Halina Czerny-Stefanskia and Ludwik Stefanski Piano Competition in Plock as well as the Nationwide Piano Forum in Plock. His activity has been appreciated and among others he has been decorated by the Bronze Cross of Merit, the Medal of the National Education Commission and three times by Award of the Artistic Education Centre. Was born on 11th August 1977 in Jaroslaw (Poland). He has graduated with excellent grade from the Karol Szymanowski Academy of Music in Katowice in piano class of Professor Czeslaw Stanczyk. He studied also an ancient music in Accademia Internazionale della Musica in Milano in class of Professor Laura Alvini. Since 2005 he is an assistant of Professor Jerzy Sterczynski in the Frederic Chopin University of Music in Warsaw. Since 2012 has a doctoral degree. Between September 2013 and June 2014 he was an associated professor in Keimyung University in Daegu (South Korea). November 1994 – First prize on domestic Piano Competition of Contemporary Music in Wroclaw. Has graduated with distinction from the State School of Music in Bielsko-Biala in the class of Maria Niedziela. He is an absolvent of the Academy of Music in Katowice under the guidance of prof. Czesław Stańczyk i prof. Józef Stompel. After studies has started his pedagogical activity at the State School of Music in Bielsko-Biala, where since 1990 is a manager of the Piano Department. Since 2003 cooperates with the Self-governing School of Music 2nd Degree in Żywiec as well. Has participated in jury panels of auditions as well as regional and Polish piano competitions. Has performed as a soloist and chamber player in Poland and abroad, has made archive recordings for Polish Radio. He was an initiator and the main organizer of six editions of the Polish Piano Competition for children and youth in Bielsko-Biala between 1995 and 2000 as well as the Polish Festival for Young Pianists in Bielsko-Biala (2001). Between 2002 and 2005 was an assistant lecturer at the Beskidy Piano Workshop in Rycerka Górna, since 2005 until now cooperates with the Warsaw Piano Workshop. He is member of the European Piano Teachers Association (EPTA-Poland), between 2006 and 2013 performed function of its vice-president. There are several dozen laureates of regional, Polish and international piano compeitions within his pedagogical achievements. Graduates from his class, which have continued their piano studies and concert activity, have won first prizes at musical competitions in New York, Paris and Osaka. Adam Podrez has been awarded many times for his pedagogical activity – twice by an Award of the Artistic Education Centre, the Silver Cross of Merit (2005), the Medal of the National Education Commission (2015) and by an Award of the Leopold Kronenberg Foundation for contemporary music popularization (2001).